O_N's grammar correction to a rule that might apply to a combined target unit (because enemy units in coherency are now treated as one unit when shot at), gave me an idea for a new rule to increase the number of allocation dice rolled by the shooter against combined targets. AND... that an officer in a combined unit could be chosen as a casualty in exchange for three 5+ results, instead of the normal 2 for the unit leader. 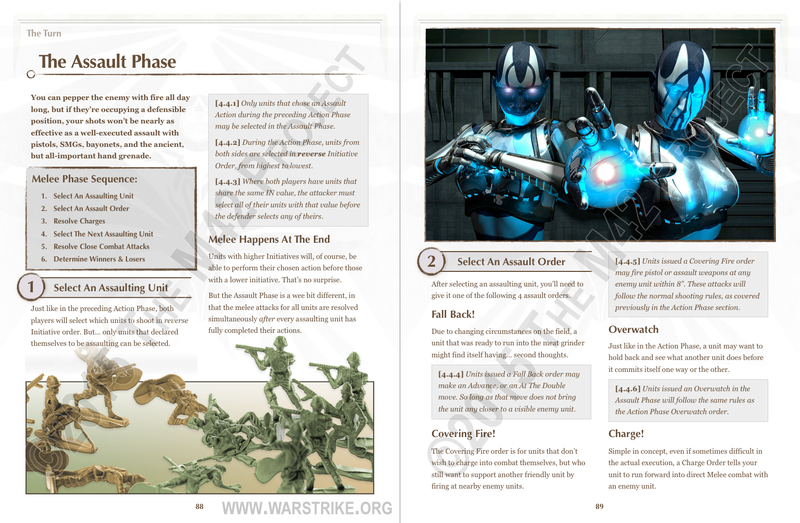 Here's the first 2 pages of the new Assault Phase. It took longer to get started on the writing for this section because I had to re-outline it after the elimination of the separate Overwatch phase. As you can see though, the result is a much simpler sequence. Three of the orders are explained with one rule each. While all that's then left is the explanation of the charge/consolidation procedure, and the final melee combat once every assaulting unit has finished moving or shooting. Here's the final page of the new Action Phase. On to Assault!!! 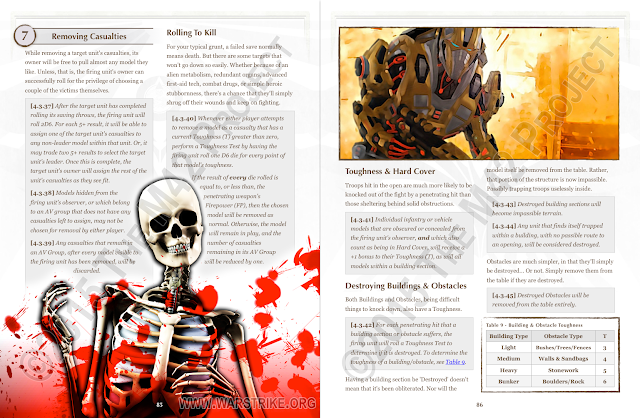 And here's the rules for removing casualties. Notably, I've removed the burning terrain bits (here and elsewhere), and clarified what happens to a unit that becomes trapped in a building. Here's the next two pages that cover how to allocate (or not) your saving throws, especially when the target units themselves get complicated. The text didn't actually need much work at all, but all the example pics had to be re-shot due to the previous versions showing D10's instead of D6's. On to Armor Saves! 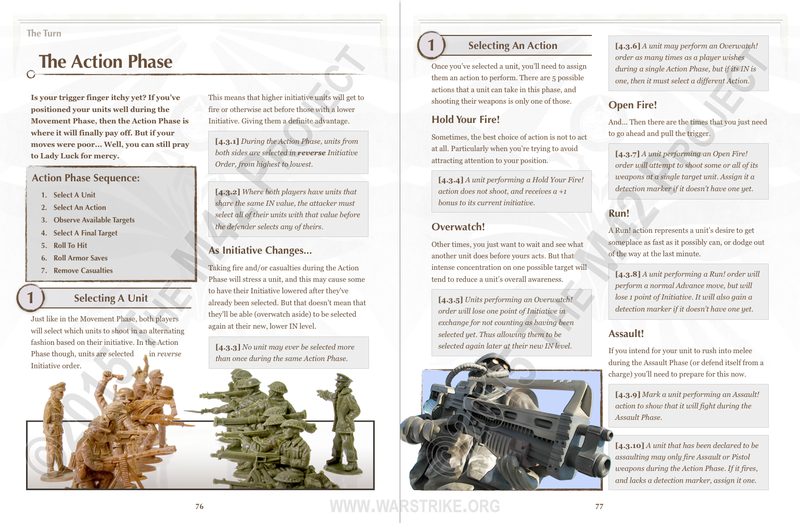 Here's the first 2 pages, plus a couple of revised pages from the Observation and Action Phase rules. 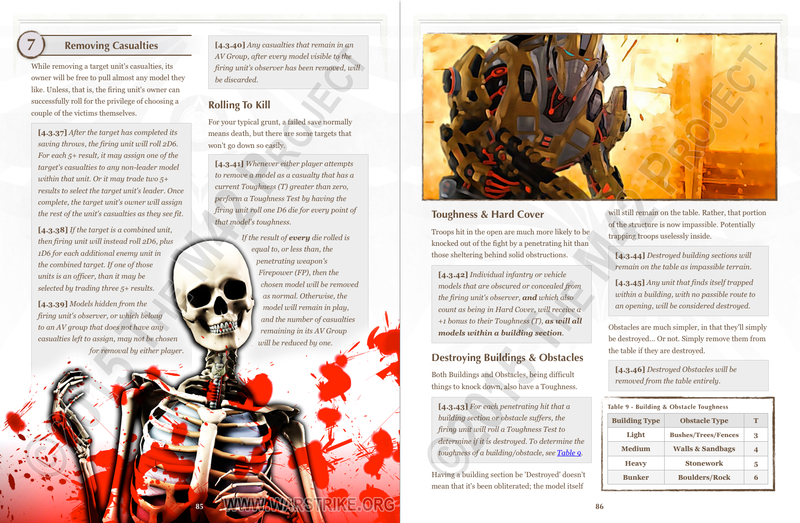 I made some changes to those when I realized that I hadn't covered what happens when you observe/shoot a building section (the section, not the guys inside it) from the inside. And... 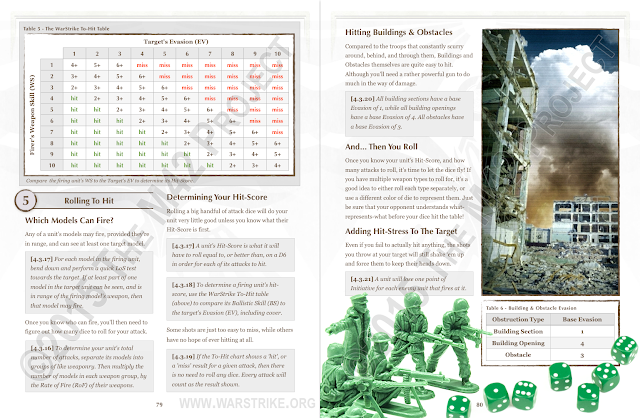 Finally we get past that comparison chart, and on to the next page, where I had room for some nice looking graphics. 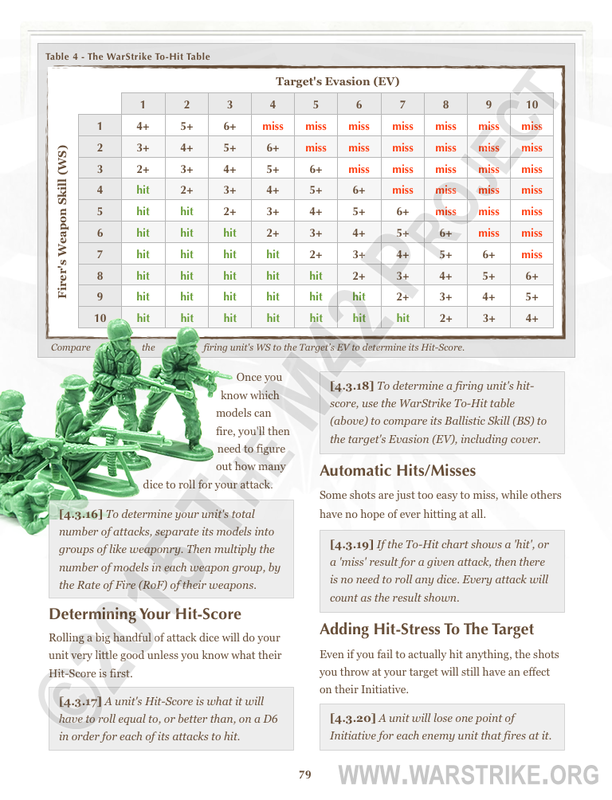 This is all of the "Rolling To Hit" rules. Next stop... Armor Saves! 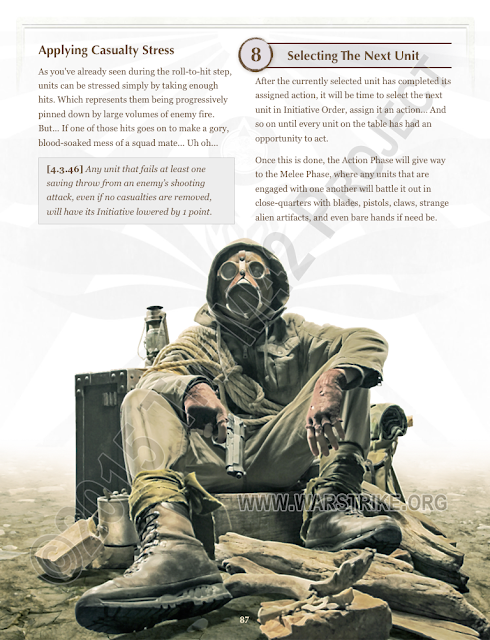 As I was pushing forward, I discovered that I really wanted the rules on cover to be in this section instead of under Observation. 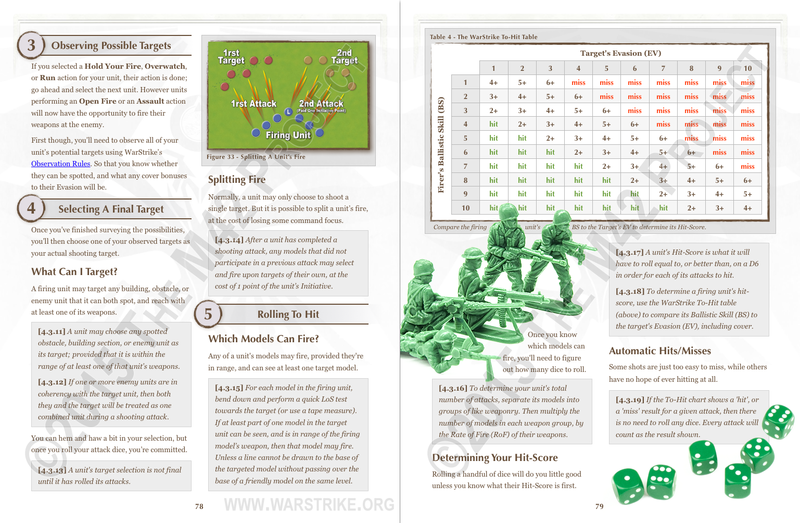 So I pulled them over, and that allowed for the space to add an explanation graphic for firing past units. And yet another revision. 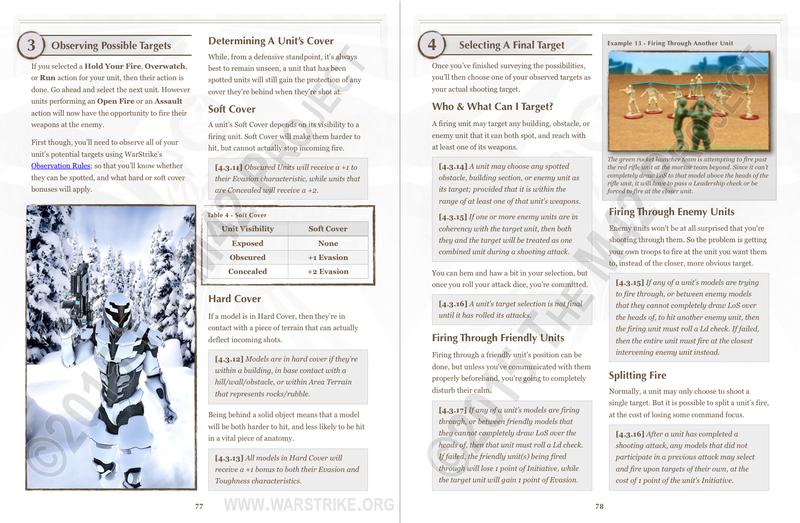 I was working on some later pages when I decided that the rules for firing through friendly/enemy units really needed to be in the target selection sub-section. Unfortunately, due to the way the sub-sections are fitting together, I had to get rid of the graphics that I had on these pages before, since there's simply no room. Incorporation headaches, parental needs, a house refinance, and one of my boys falling out of a tree have conspired to keep the next two pages from getting from 85% to 100% done. 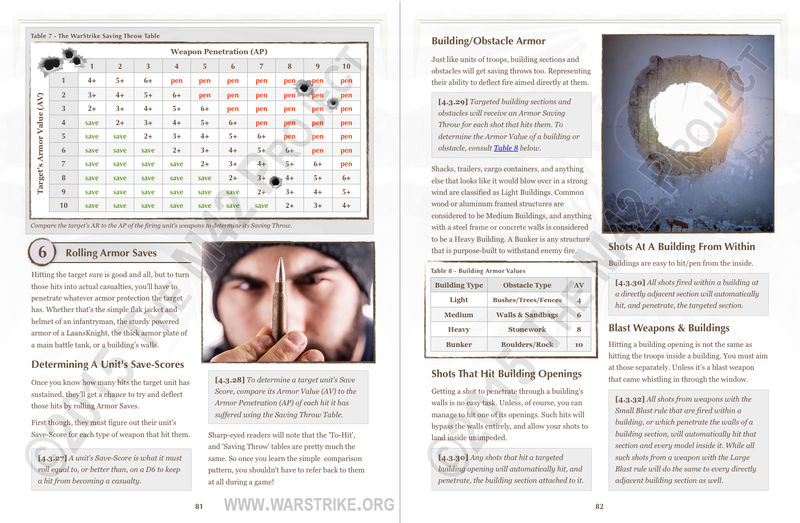 But here's a small revision that I made to the previous page 79, where I added the Hit-Stress rule the end of that page in place of the dice graphic. 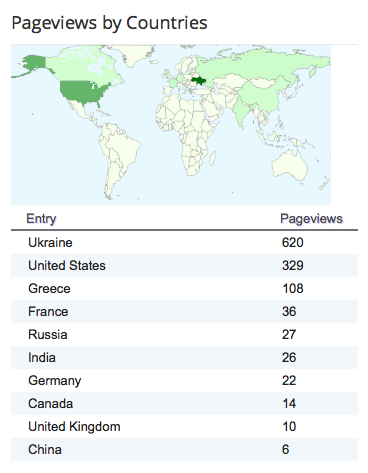 For most of this blog's history, the country-view numbers have been relatively consistent. In that the US usually leads the world with 10 times the views of Russia, which usually has 5 times the views of anywhere else. But recently There's been quite the mixup. Greece shot to the top of the chart just above the US a week or so ago, and now as it fades down past an ascendant France, Ukraine has come in with nearly double the US numbers. 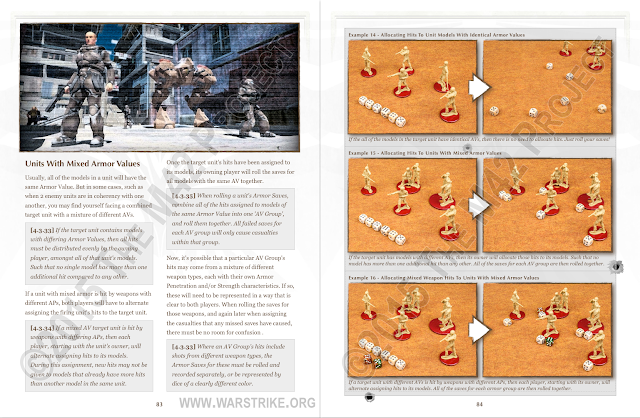 Here's part 2 of the Shooting Action Phase Rules. 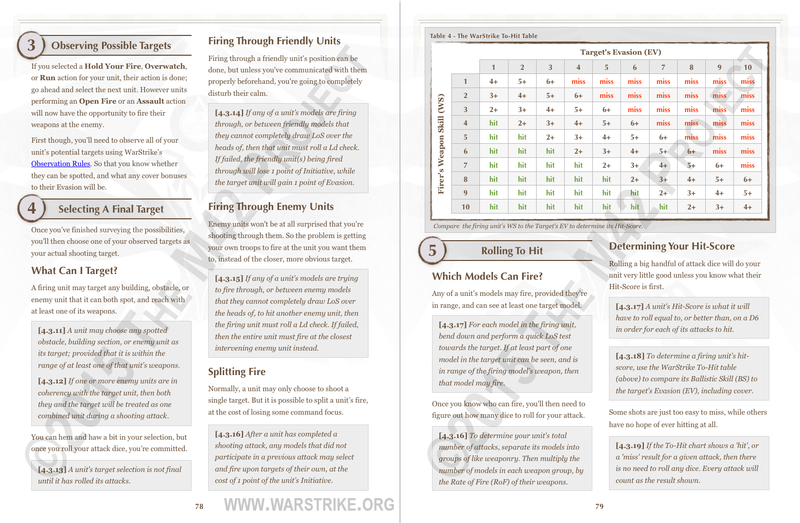 Notable here is that splitting fire is possible, but it costs a point of Initiative. Which should balance out the advantage of enemy units losing a point of Initiative just for being shot at. On to the Shooting Action Phase... With all the visibility stuff removed, this section should go quick. Here's the last page of Observation rules that explain how hard and soft cover work in the game. 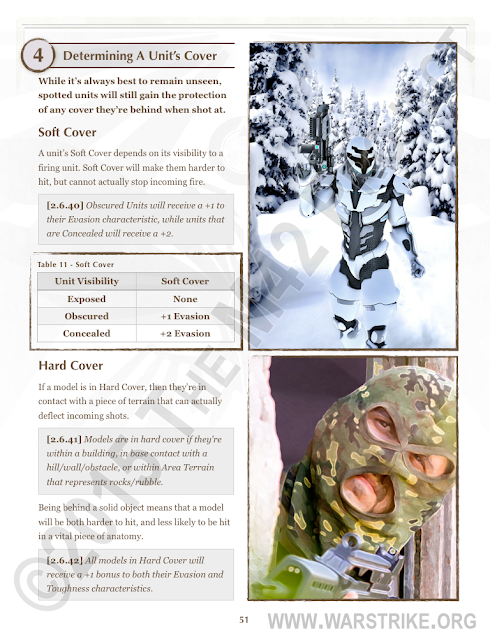 Mr. Camo-Head appeared in an earlier page, but he's been swapped out there and moved here because he's the best image I have to suggest Hard Cover with.